When President Obama announced last year that the United States and Cuba would be working to restore diplomatic ties after a nearly 50-year standoff, it didn’t take the fashion world long to look to the country for inspiration. Between Stella McCartney’s Resort 2016 presentation peppered with Fidel Castro look-alikes and Chanel announcing it would be holdingits Cruise 2017 collection in the island’s capital, the colorful Latin-American culture and 1950s panache has possessed a unique throwback appeal for designers. 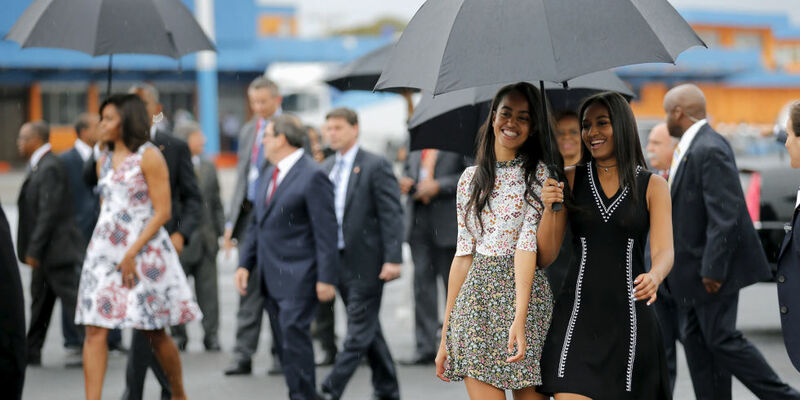 But with the arrival of First Daughters Malia and Sasha Obama in Havana this weekend, it would appear the latest fashion trends are descending upon Cuba. The sisters accompanied their parents, President Barack Obama and First Lady Michelle Obama, on the historic visit—a first for any U.S. President in nearly 90 years. Malia slipped into a floral sundress, while Sasha was bedecked in a relatively affordable Shoshanna black-and-white flip-skirt frock. The price-conscious look spoke to their mother’s frugal-chic approach to fashion; throughout the Obama presidency, the First Lady has frequently outfitted her daughters in J.Crewdesigns. To complement their dresses, the girls bounded down the steps of Air Force One in age-appropriate flatform sneakers and ankle-strap flats. Despite the torrential downpour, the smiling pair visited the Museo de la Ciudad with their parents, the first stop along their three-day tour of the country, and graciously greeted legions of Cubans who came to catch a glimpse of the growing girls in yet another fashionable appearance. The most recent was just a little over a week ago, when they dazzled at the Canadian state dinner inNaeem Khan gowns, further proof that these young ladies are following in their mother’s style-ambassado footsteps.